Contemporary and uniquely beautiful, this stunning ring radiates glamour. 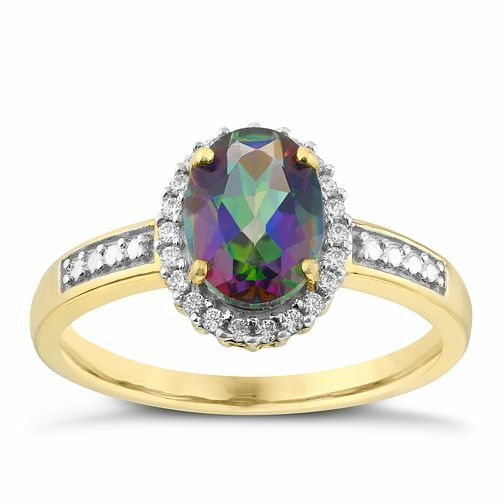 Crafted from 9ct yellow gold, this chic ring has an oval shaped Mystic Topaz surround by a halo of glittering cubic zirconias for sophisticated sparkle. Further cubic zirconias are set along the shoulder for a glamorous finish that combines classic style with modern details. 9ct Yellow Gold Mystic Topaz & Cubic Zirconia Oval Ring is rated 5.0 out of 5 by 1. Rated 5 out of 5 by Anonymous from Unique I love this ring. Never seen anything like it before! Not too sparkly and has great green & purple tones in this mystic topaz stone. Great fit too, doesn't feel too chunky.